Tell us what you’d like on your urn charm. Besides the pet’s name, what design elements / symbols of love would you like to include? See photos for examples. If you don’t see what you want, let us know and we’ll try to match your vision. What are the primary colors of the pet’s urn? We’ll try to choose a ribbon that matches. If a gift, we’ll include a blank note card. 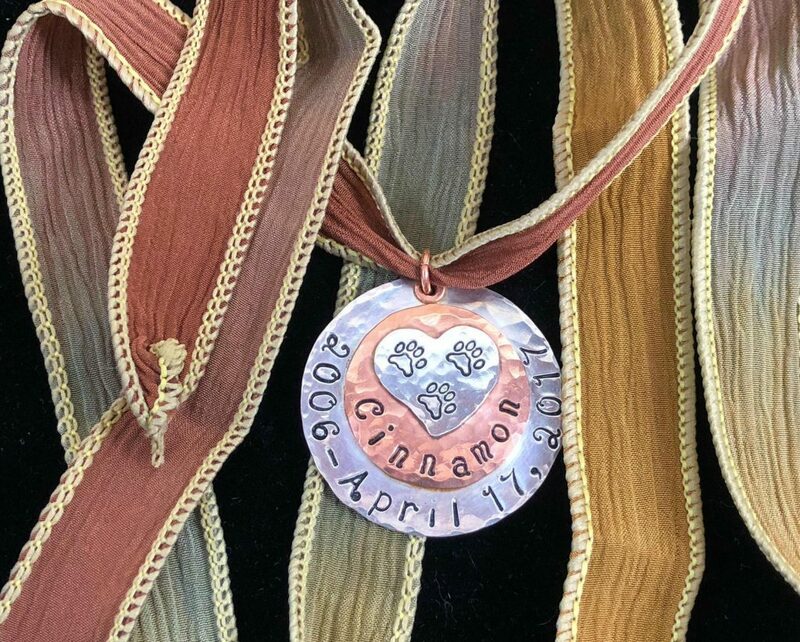 Honor a beloved pet with our custom pet urn charms in sterling silver and copper, including a hand-dyed silk ribbon to match your pet’s urn. 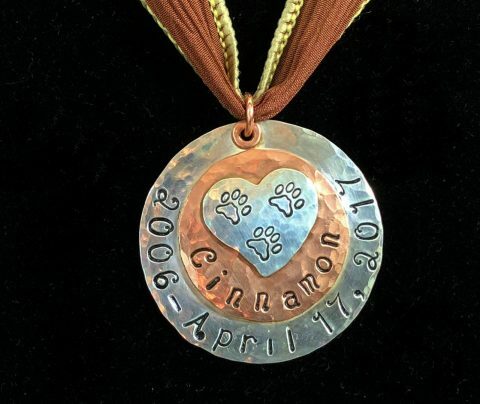 Custom pet memorial urn tags are one way to honor the memory of your dog, cat or other beloved angel animal. Each piece we create is tailor-made to order with sterling silver and copper. Size is about 1.25″ in diameter. Pet-centric charms can be incorporated. No two pieces are exactly alike. We will create a customized layout and design by request. We have a script or non-script font to choose from and various stamp designs to incorporate into the piece. Once you place your order we can discuss your vision of the piece so we can make it happen. For the finishing touch, we’ll choose a hand-dyed silk ribbon for the urn charm (included), to connect it to the urn itself. Let us know the color of the urn to be used and we will do our best to choose a complimentary color. 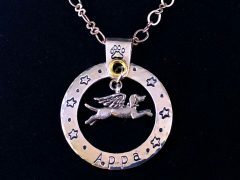 All handmade jewelry purchases benefit the Tripawds.com community, which provides education, resources and support to parents of dog and cat amputees because of bone cancer, accidents and birth defects. Price does not include an urn. Your memorial pendant charm is wrapped in a free gift bag and shipped to U.S. customers via U.S. postal service first class mail. 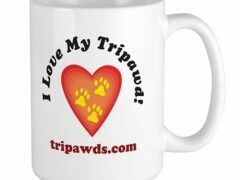 Every tag is unique and made to order by Tripawds founders Jim and Rene. FYI, tiny imperfections may exist but keep in mind that’s what gives it the one-of-a-kind, handmade look 🙂 Tripawds jewlery includes a 100% Satisfaction Guarantee against manufacturing defects. 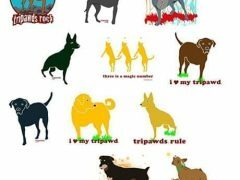 Our jewelry designs, the word “Tripawd,” our three-paw logo and the phrase “It’s Better to Hop on Three Than Limp on Four” are registered copyrighted trademarks of Agreda Communications, founder of Tripawds.com. Be the first to review “Custom Pet Urn Charm in Sterling Silver and Copper” Click here to cancel reply.